This autumn, Nik Kershaw will be touring the UK with “An Evening With Nik Kershaw” and one date in particular promises to be extra special. On 14 September, Nik will take to the Hertford Theatre stage to share an evening of songs and stories with the audience while raising vital funds for a charity close to his, and wife Sarah’s heart. 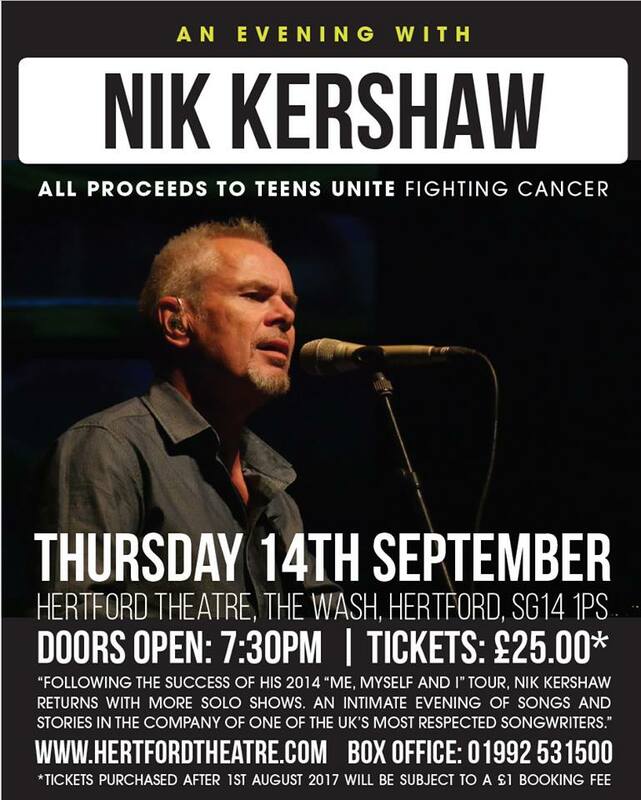 All proceeds from the Hertford Theatre show will be donated to Teens Unite Fighting Cancer. Teens Unite is an incredible charity that has been providing on-going support to 13-24 year old’s fighting cancer, from diagnosis through to post-remission for the last 10 years. Seven young people are diagnosed with cancer every day in the UK. Teens Unite brings young people together through workshops and activities so they can spend valuable time with others their age in a similar situation to themselves. The charity helps to rebuild the confidence and self-esteem of those it supports and prevents feelings of isolation during what can be a long and lonely battle. Tickets are selling fast so book now to help this wonderful charity and spend the evening in the company of one of the UK’s most respected singer-songwriters.